Today, more and more people choose cremation. Following cremation, various options exist for the disposition of the ashes. Some choose to retain them in their homes, some decide to bury the urn or place it in a columbarium at the cemetery. Still others elect to scatter the ashes in a place that holds special meaning for the deceased and the bereaved. The reality is that most survivors need a place to focus their grief and a place for memorialization. At Roselawn we have many options to fulfill this need. We offer traditional ground burial, either on a family burial lot or in our Autumn Rain Cremation Garden. Many inside and outside niche options are available for those who prefer above ground inurnment. Our Footprints feature allows you to scatter the ashes in a permanent scattering garden and provides a bronze memorial plate. 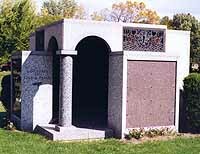 The Sanctuary of Love and Peace was the first structure in Monroe County designed for cremated remains. The granite building is highlighted with beautiful stained glass windows and bronze name plates. Both individual and companion niches are available. Resurrection Mausoleum has both individual and companion niches. Two beautiful carvings, an open Bible with the “Lord’s Prayer,” and a profile of Christ with the words “I am the Resurrection and the Life” identify this mausoleum. Bronze name plates memorialize those inurned there. Designed for ground interment the Autumn Rain Cremation Garden with its landscaped setting makes an ideal place for quiet meditation and reflection. Both individual and companion spaces are available. Our Veteran’s Columbarium features a 14 foot high white marble monument flanked by American Flags. Designed to honor America’s Veterans, it contains all individual niches. Military insignias of the US Armed Services are carved in the gray granite walls. The Chapel of Prayer Mausoleum has an indoor heated Chapel that may be used for memorial services. Sunlight streams through clerestory windows to enhance the beauty of the polished granite. Both inside and outside niches are available. 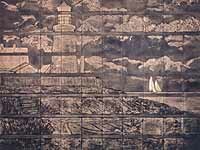 A limited number of niches feature solid bronze fronts in a beautiful Michigan lake scene design with a lighthouse. Granite benches provide a place to pause and reflect on the life of a loved one memorialized here. Urns for the permanent containment of cremated remains come in a variety of sizes, styles and materials. There is an urn to satisfy every taste, every requirement and every budget. This beautiful glass and bronze niche unit is located in our Chapel Mausoleum. Family and friends may see the bronze urns through the glass faced niches. Our Footprints feature allows for personal memorialization for those who choose to have their ashes scattered. Provisions have been made to actually scatter the ashes in a dedicated area. The granite monument features the “Footprints” poem cast in solid bronze. Individual bronze name plates complete the tribute to a loved one remembered here.